Amazon is well-known as a product merchandising platform, but have you also considered that Amazon is one of the largest search engines in the world? With thousands of similar products for sale, it is important to optimize the keywords for the products you offer. Apply the following tips to your Amazon business in order to improve your e-commerce success. Amazon has set a 100-character limit for keywords. Because the maximum is so small, it is important to be careful and intentional with the words you choose to attach to your product. Use hyphenations. Hyphenated words will cover all possible combinations of those 2 words, so can get multiple keywords out of only 2 words. Do not worry about capitalization or distinguishing between singular and plural forms. The search will include all forms of the words you use. Do not use filler words, conjunctions, or other unnecessary additions. Amazon searches automatically omit unnecessary words from searches, so they will never help your product appear in more searches. Use spaces when separating keywords, not commas. Other than hyphens, punctuations serve no purpose except to take up valuable characters. Your priority with the bullet points is to highlight the most important features of the product. Bullet points are also an ideal place to reiterate anything in the title or description. Each bullet point should begin with a capital letter and should be a phrase, not a sentence. Also, do not include pricing or promotional information in your bullet points. When it comes to writing copy for your product, it is important to keep it short and concise. Potential buyers are not going to be interested in reading extremely long-winded descriptions. Include important and appealing information. But remember the shorter it is, the easier it is for customers to read and process. 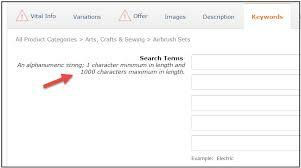 Backend search fields are the ideal place to include keywords you could not fit in the title or description. You are still limited in the characters you can use, however, so it is important to choose your words carefully. Avoid any repetitions and punctuation, as they take up valuable characters. Try to use unique words that apply directly to your product. Amazon’s A9 search engine uses an algorithm to decide which products are listed first in a person’s search. The algorithm focuses on performance and relevance. If your product has performed well and has a high number of sales, it is more likely to be ranked higher. The second factor, relevance, is regarding your keywords. The more keywords your product has that match the search, the higher it will be in the search results. Palmetto Digital Marketing Group is an Amazon e-commerce management company. We can run your Amazon business and help you boost your sales. Contact Palmetto Digital Marketing Group for more information or guidance for your Amazon business.